Logitech introduces the CRAFT Advanced Keyboard with a creative input dial ideal for content creators and professionals. The aluminium dial offers immediate access to various context-specific computing tools such as tools in Adobe Photoshop and Microsoft Excel. The creative input dial offer easy-to-access control and input to increase precious and efficiency for a truly productive work flow. 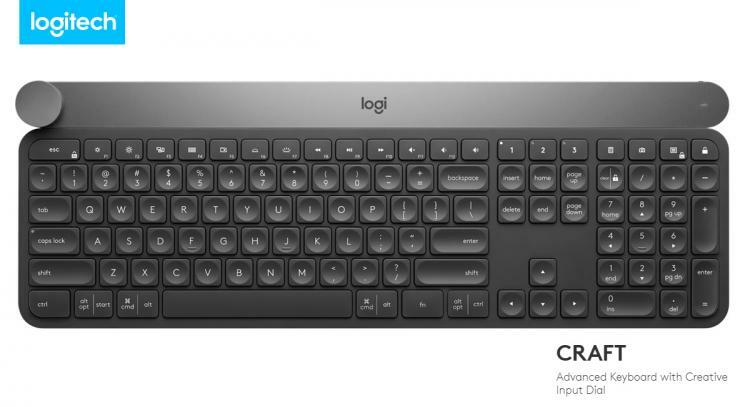 The Logitech CRAFT is a wireless keyboard with an input dial that aims to improve productivity. Install profiles from Logitech Options software for the apps in Windows or macOS for Adobe Photoshop CC, Adobe Illustrator CC, Microsoft PowerPoint, Microsoft Excel and others. The CRAFT breathes to life with a backlighting flourish when it turns on — and the keys light up the moment your hands approach. The CRAFT is designed to offer efficiency, precision and stability with its silent keys. With the touch of an Easy-Switch button, you can easily switch between – and type on – any three connected devices, whether you are using a Windows PC or Mac. The Logitech CRAFT Advanced Keyboard is open for pre-order and will be available this October 2017 with an MSRP of $199.99USD/GBP 179.00.